The PLT file format, also called HPGL, is the standard language for printing line drawings. Created by Hewlett-Packard, it has specifically been designed for 2D graphical information for the HP range of plotters. The PLT file is structured on the basis of a set of commands embedded in the ROM of pen plotters. This helps reduce the work required by applications programmers to create plotted output. Another feature of PLT is that it uses two-letter mnemonics as instructions for drawing lines, circles, text, and simple symbols. Hewlett-Packard plotters use PLT as its primary printer control language. Although it wasn’t meant to be an interchange format, PLT is now also used by most other software suppliers and has become a standard for almost all plotters. PLT is supported by many CAD, charting and word processing applications – among them Autodesk AutoCAD and ArtCut on Windows and Pocket PC CAD (DWG/DXF/PLT) Viewer on Pocket PC. 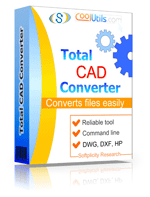 To convert PLT files to PDF, TIFF, JPEG or other formats use Total CAD Converter. It converts .plt files in batch via user interface and command line.